When i saw that OnlyCurlsLondon had launched their own product range i could not wait to get my hands on it! If you follow me online, you will know that the microfibre towel by this brand has been a definite game changer for me. Wash days are easier and drying my hair is not only faster, but leaves me with less frizz. 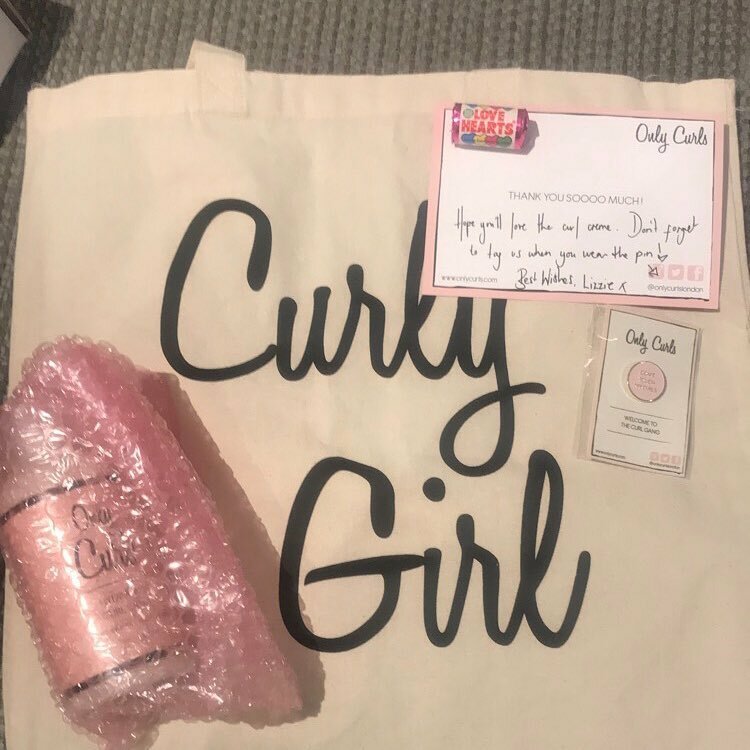 This brand is an exciting one to follow, and they have started out with a hydrating curl creme and an curl enhancing gel, as well as cute little curl accessories which every girl needs! Available on their own website as well as my go-to hair store naturalisticproducts. First off the colour scheme that these products have gone for, is perfect. Pink and white is just simple, girly and stands out on my shelf. Not to mention pink is my favourite colour! "Nourish your curls with this hydrating curl creme that smoothes curls and minimises frizz. Our special blend of Shea Butter, Marula Oil and Aloe, naturally replenishes moisture and restores curls back to their original curl pattern"
For those of you who don't know, Aloe and Shea butter are amazing for our hair. Shea Butter helps your curls withstand harsh weather by conditioning it and keeping it frizz free by locking moisture in. Aloe Vera contains enzymes which can help with scalp problems such as itchy scalp and dandruff, as well as acting as a conditioner, promoting healthy hair growth. The ingredient list in this is amazing. Marula oil is another ingredient in this perfect cocktail which is nourishing to your scalp and assists in moisture retention. and this product is not tested on animals! The thing i like alot about this product, is how watery it is. For me, products which are runny mean that alot less has to be used and that water is the first ingredient, making it very hydrating. I was not wrong in thinking that with this one. As soon as this was on my hair my curls just soaked it in and came alive. They were shiny, soft, and so bouncy! It is rare for me to fall in love with a product on the first use, but i couldn't help it with this one. It ticked all the right boxes in what i look for in a curl creme. I have taken a while to get this review done, because i wanted to fully try it out. The first time i tried it was on wash day. I needed to try it a few different ways with a few different products and see how long the results last. Again, no disappointment! A midweek curl refresh using this creme after dampening sections, gave me amazing results which lasted right up until next wash day a whole week later. The directions on this say to use it on cleansed and conditioned wet hair, combing through and then scrunching. I really like the smell of this hydrating curl cream, it has a very fresh and buttery scent which isn't over powering and lingers in your hair for the whole day. I haven't found anything that this cream doesn't work with yet, and i am so excited to try out the styling gel. This brand is deffo one to watch out for and i cant wait to see what else they come out with. Check out this video below of me using the curl creme and the microfibre towel in my refresh routine. Protein: Why is it so important?